The museum is one of the smallest we’ve visited, making it very manageable with younger children. Split over two floors, it’s possible to keep an eye on kids running in different directions (providing they don’t dash for the stairs), and there were plenty of yellow-shirted mathematicians on hand to explain how each exhibit worked. 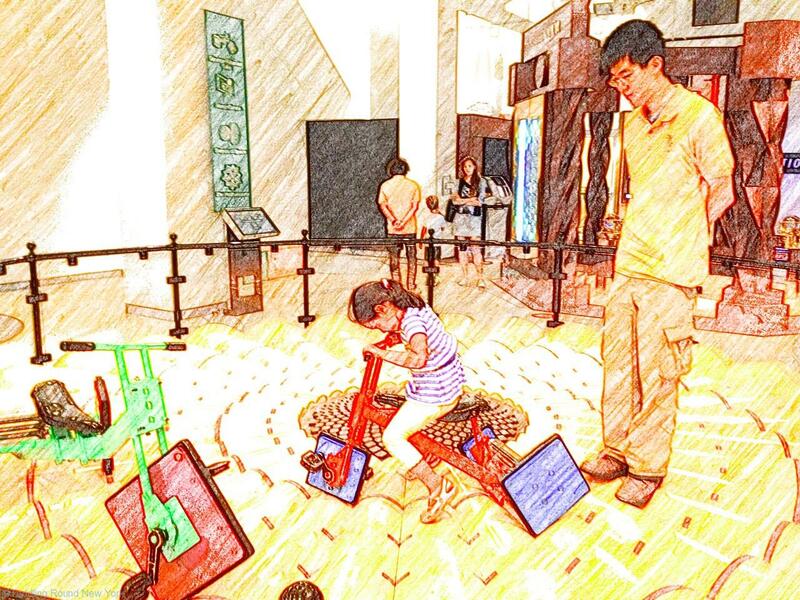 Everything was interactive and designed for curious hands and minds. T was v taken by a yellow corrugated circle, which you could ride around on a square-wheeled tricycle. The kids bumped around the small track with enormous pride and excitement. The only rule is that you have to wear closed-toe shoes to go on this one. She also loved ‘Coaster Rollers’, a little coracle boat which she could pull across the ‘water’ made from large acorns with evenly shaped diameters. My personal favourites were the Human Tree, and Polypaint. The Human Tree was a digital screen that showed successively smaller copies of yourself combined to make you look like a very strange tree. You could choose which season to be in, with leaves, blossom, or snowflakes. Two of you could stand side by side, combining your images to make funny patterns with both your bodies. Our favourite was of hundreds of tiny Ts looking like branches on my tree. So now we both have a basic understanding of fractals – previously limited to that line from ‘Let it Go’ in Frozen. Polypaint was fascinating. Using what looked like real paint pots and brushes, you could paint on a digital screen to create intricate geometrical patterns. Once you were satisfied with your design, you could project the pattern onto your body to look like an outfit. We spent a long time in this booth. The Tracks of Galileo exhibit kept T and her friend L happy for quite a while. Two tracks can be infinitely adjusted so that you can race cars down a short ramp. A digital scoreboard helped them see which shapes gave the fastest path down to the bottom. My only reservation on this one is that the cars have to start very high up, so an adult has to stand there to reload the car each time. Little stools would be useful here. I really liked the way each exhibit encouraged both thought and creativity, and incorporated both art and music. It didn’t matter if the kids (or the adults, ahem) didn’t fully grasp the mathematical principle behind each display, you could still have a lot of fun playing and exploring. I think this is a fantastic introduction to maths for kids aged two and up, and a really good, educational yet fun day out. Definitely worth a visit.